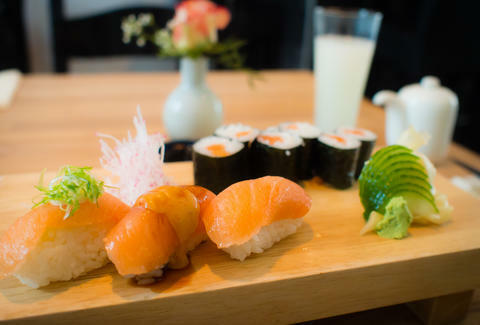 We’re pretty sure the title says absolutely everything you need to know, but in case you’re the kind of person who needs things repeated: here are 10 places in New York where you can get UNLIMITED SUSHI, UNLIMITED SAKE/BEER, OR BOTH. 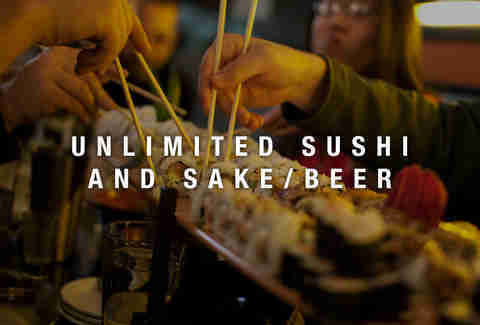 A cool $33 buys you two hours of unlimited sushi, beer, and sake. Choose your time wisely, though, as weekend hours lend themselves to all of the bros on the entire island of Manhattan and beer all over the floor. You could come here for just the AYCE sushi for $35, but that seems kinda absurd when for just another $10, you can also get unlimited beer and sake. Enjoy this boozy/sushi-y wonderland for a magical two hours before you turn back into just a regular limited-eating pumpkin. A regular AYCE sushi special here will run you $28.99, but you can kick up the level of fun for a flat $7 (!!!) 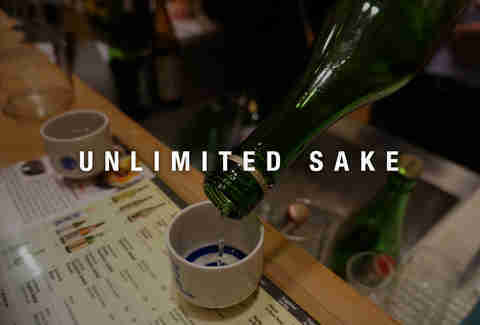 and enjoy the AYCD beer and sake special, as well. Buffets take on a whole new meaning at this bountiful sushi utopia. Monday-Thursday, enjoy the sushi/seafood buffet lunch for $18.95, or the dinner for $31.95. Friday dinners are $34.95. On weekends, the lunch special is $24.95 and dinner is $34.95. This hole-in-the-wall sushi spot on the Upper East offers a special menu of AYCE sushi and maki hand rolls for $22.95. You have an hour and 45 mins to finish all the sushi your little maguro-loving heart desires. Be warned, though, that you should only order what you can actually finish because they’ll definitely charge you for wasted food. 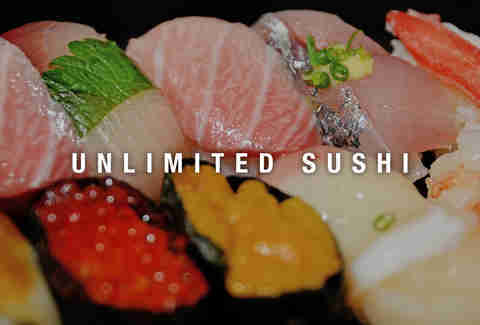 After a long day of all the finance things, you could probably stand to loosen your tie over a plate of unlimited sushi. Shinju Sushi offers a can’t-stop-won’t-stop menu from 4-9:30pm for $22.95. This one-time price also earns you a hot sake, or another complimentary beverage if you just aren’t feeling like sake today. From noon to 9pm daily, drop $28.89 on all-you-can-eat sushi, plus miso soup, salad, teriyaki, tempura, udon, soba, and/or hibachi. But be careful what you order at this gastronomic gut buster... you have only two hours to complete your task. $20 for lunch or $25 for dinner will get you unlimited access to not only all the sushi rolls, but also soup, salad, and select appetizers. The website describes Cho Cho San as the “most authentic Japanese cuisine in town,” and while we highly doubt that, we do not doubt that you will still love this place for its sake special. For a cool $10, you’ll score all the sake you want while you feast on what is more likely above standard, if not damn decent sushi. Meagan Drillinger is a freelance writer for Thrillist and keeps a spare shirt in her purse for when she inevitably spills condiments on herself. Follow her on Twitter, Instagram, and Facebook at @drillinjourneys.